Lazinc is presenting its third solo exhibition with award-winning artist, illustrator, and author, Oliver Jeffers. Observations on Modern Life will be the first comprehensive showcase of the artist’s sculptural and collage work of the last decade, featuring approximately 50 pieces in one place. 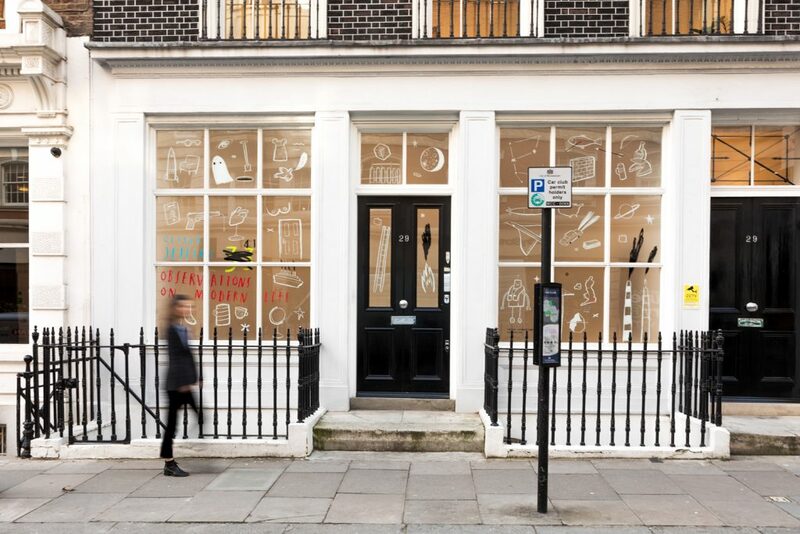 The exhibition follows the October 2018 release of Rizzoli’s recent monograph, The Working Mind and Drawing Hand of Oliver Jeffers. 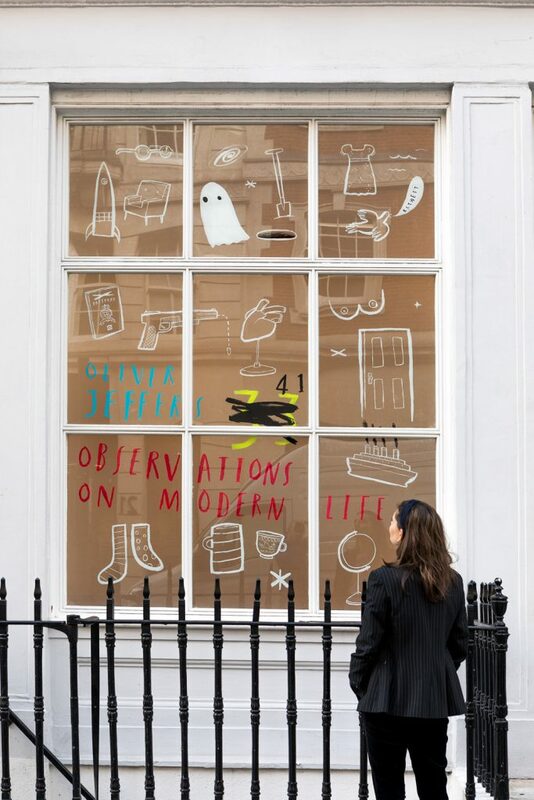 In Observations on Modern Life, Oliver Jeffers engages this shifting sea, the Wild West of future living, at a time when it might be easier to react to something than to conceive a thought from nothing. Using sculpture, painting, found images and collage, Jeffers takes cues from the idiosyncrasies of our world in his humorous, poignant and often political artwork. Collected over the past decade, the exhibition will cover a wide range of Oliver’s ongoing series. With his maps and globes, our idea of borders and boundaries are erased and replaced with new labels. In his Disaster Series Jeffers reacts to found land and seascapes, ‘completing’ them with a new central focus in the form of a scene post-accident, suggesting that our interests lie in the spectacle of drama over tranquility. While in his social commentary works, he makes an effort to engage constructively in the current affairs of today, in a conscious effort to not contribute to the noise of anonymous complaining and blaming. 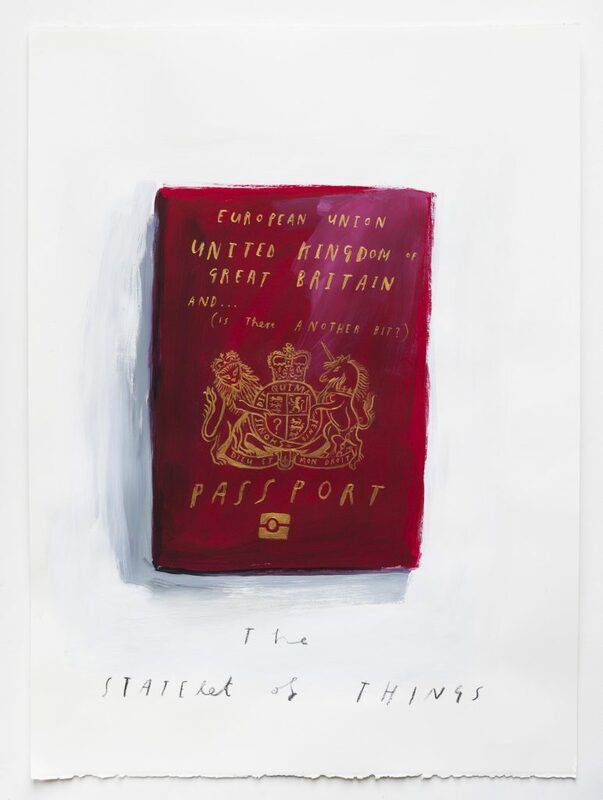 Oliver Jeffers’ work sensitively balances duality of meaning and explores complex issues from various perspectives. Raised in Belfast as a child and now based in Brooklyn with his own young son, his work often takes a political stance or sense of social responsibility. 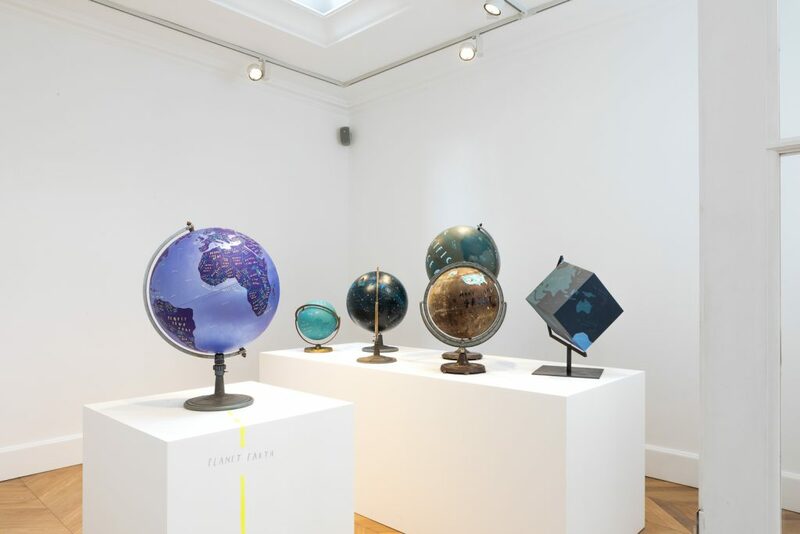 From his celebrated children’s books to his most recent public art sculpture on New York’s High Line Park, an immersive installation exploring the Overview Effect, which invites its viewers to consider their perspective on Earth and their position as part of a single, fragile system. Jeffers’ works have been on view at London’s National Gallery, the Brooklyn Museum and the Irish Museum of Modern Art in Dublin, as well as being the recipient of numerous awards including a BAFTA for the animated short film of his book Lost and Found, Time Magazine Children’s book of the year for Here We Are and The New York Times Best Illustrated Books. Oliver Jeffers makes art and tells stories – his visual world a unity of curiosity and humour. Known for his distinctive characters, uncanny, vast worlds, and handwritten text, his substantial body of work takes on many forms from collage to figurative painting to performance art. His critically – acclaimed picture books have been released internationally and translated into more than forty languages as well as earning No.1 on the New York Times bestsellers list on multiple occasions Jeffers’ has been the recipient of numerous awards including a BAFTA for the animated short film of his book Lost and Found, Time Magazine Children’s book of the year, The New York Times Best Illustrated Books, the Nestle Award, Bologna Ragazzi Award, The Orbil Prize, The Irish Book of the Year, The British Book Design Award, and The Blue Peter Book of the Year. 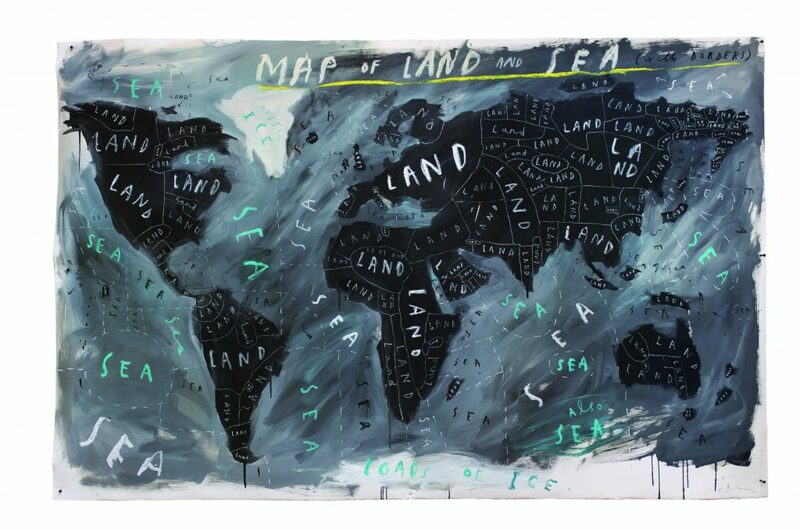 Jeffers’ paintings have been exhibited in museums and galleries internationally including the Brooklyn Museum and Bryce Wolkowitz Gallery in New York, National Portrait Gallery and Lazarides, now Lazinc, in London, the Irish Museum of Modern Art in Dublin, and the Palais Auersperg in Vienna. Jeffers has worked with numerous artists and organisations such as Veja Sneakers, Tattly, Sam Winston, JR and most notably U2, with whom he created several music videos and assisted in the art direction of their global Songs of Innocence tour. Most recently Jeffers has brought his work to the public sphere with Here You Are, a free standing mural on the Brooklyn Bridge Park, as well as The Moon, the Earth and Us, an immersive art installation on New York’s High Line. Jeffers’ grew up in Belfast, Northern Ireland, and now lives and works in Brooklyn, New York.